NYS Growth Scores, how can they inform our decisions? On August 21, 2015, school districts across NYS received growth scores for teachers and principals. The principal growth score is also considered a building growth score and will play a bigger part in teachers’ composite scores next year with the required changes to our APPR (annual professional performance review) plans. As a superintendent I have been a vocal proponent for school improvement reforms including the alignment to common core standards, teacher and principal evaluation, data informed decision making, and NYS testing for an annual system check and alignment. Reforms should actually help us to improve our systems. I cannot support the use of growth scores without a thorough and clear explanation of how the scores are determined—the video on www.engageny.org “Growth Scores Explained” sounds logical but it dioesn’t go far enough in helping us to understand and explain what we can do with this information. I also wonder if it’s still an accurate explanation of how those scores are determined. Consider the story of school improvement in our district. 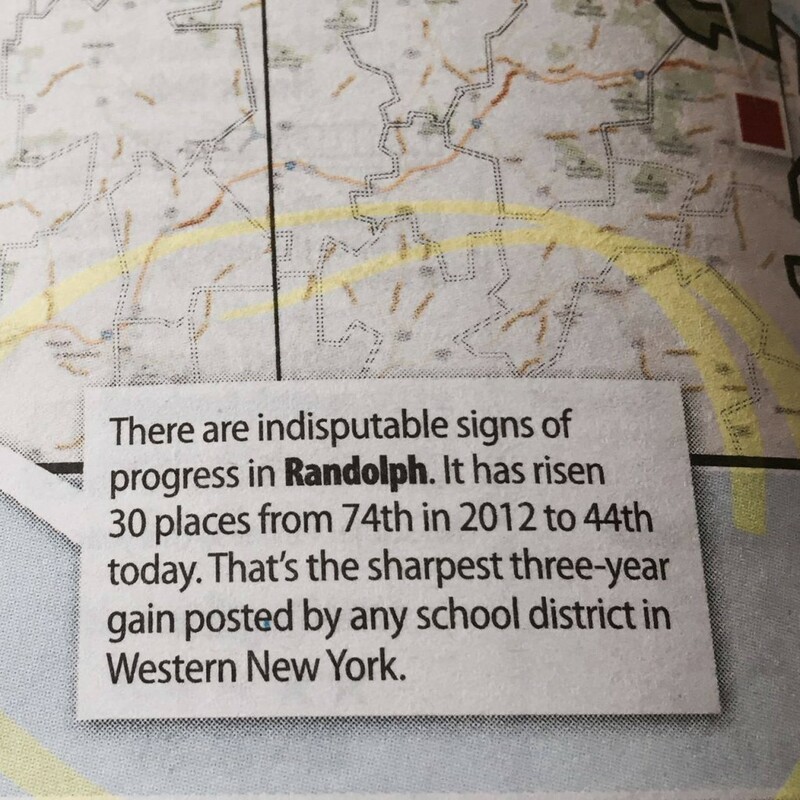 Since 2012, Randolph Central has improved our academic achievement results on NYS tests significantly. In one measure our elementary school has gone from a Business First ranking of 174 out of 276 to 59 and our district has increased its rank from 74 to 44 of 96 Western New York districts. We have had the sharpest 3 year gain of any school district in WNY. Our incredibly hard working teachers have aligned their instruction, as a system, to the NYS common core learning standards. They have laboriously studied and then taught the Math modules from www.engageny.org. Teachers have modified inadequate ELA modules and struggled to put together a comprehensive ELA program that is aligned to the more rigorous common core standards. They have implemented adaptive testing with diagnostic instruction, participated in data team meetings to ability group all students for academic enrichment in Math and ELA daily, piloted and are now implementing technology based programs as tools for instruction and studied the NYS testing results, gap analysis and annotated released questions. They have done absolutely everything we have asked of them. At the same time our growth score has gone down every year. This year that same elementary school–that’s gone from 174 to 59 for its increases in academic achievement received a 10/20 for its growth score down from 14/20 last year and 16/20 the previous year. A growth score of ten puts this building principal at the lowest end of effective. In the new mandated APPR plans that same ten will equal ineffective in teacher and principal evaluation. We can basically conclude that the better we do academically the lower our growth score. If growth scores as a reform are meant to improve learning for students, someone needs to help me understand how. Here’s my annual update regarding our academic performance as a district, as measured by the publication Buffalo Business First using data from the NYSED website and ranked within the 96 school districts of WNY. There’s no mystery to the rankings, they are based on four years of Regents diploma rates, as well as four years of results from 24 grades 3-8 and Regents tests, considering the percentage of students who met or exceeded (achieved 3s & 4s or 85 and above) state standards on each. There is more weight given to the most recent of the four years. It’s data, plain and simple, and it is the one time per year we have a comprehensive review of how our students are performing as compared to all other students in Western New York. For those of you who may ask, “why does it matter? Why are test scores important?” I would answer, “our performance results are one of the ways we can gauge if we are making good instructional decisions, if we are aligning our system to rigorous standards, if we are helping every child to achieve at the same levels, or better, than students in all other school districts.” In short, we want to do well by the children of the Randolph school district—to do our very best to prepare them for life after school. Here’s one way for us to know if we’re doing so. Gail N. Chapman Elementary School, led by veteran Principal Jerry Mottern, has seen the most significant gains in the school rankings as the are #59 of 262 public and private elementary schools in WNY. Our elementary students and teachers have increased their achievement results from the 2014 rank of #104, 2013 rank of #174, and 2012 rank of #202. How’s that for increased results Randolph? Next we look at our Randolph Middle School, led by Principal Laurie Sanders, compiled using our 7th and 8th grade Math and ELA and Science results. The MS results rest squarely on the shoulders of a very few teachers and they have worked incredibly hard to maximize learning for their young adolescent students. 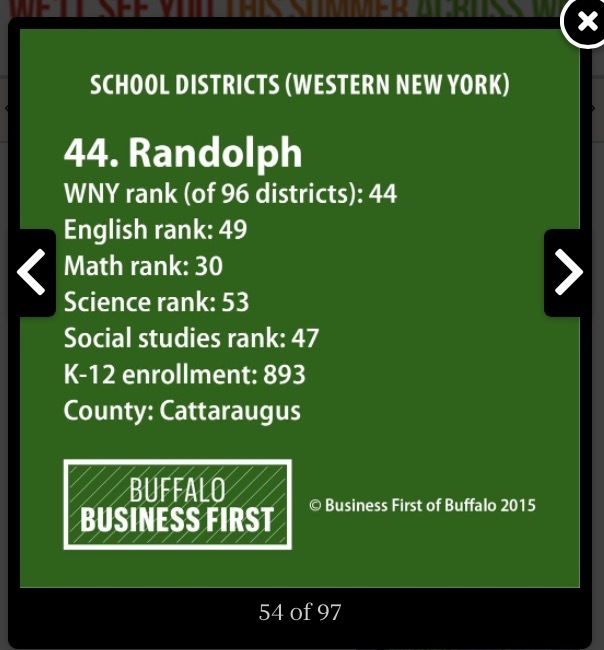 Here Randolph is up to a WNY rank of #95 out of 194 middle schools. That’s an improvement over the 2014 rank of #121, 2013 rank of #123, and 2012 rank of #145. Nice! 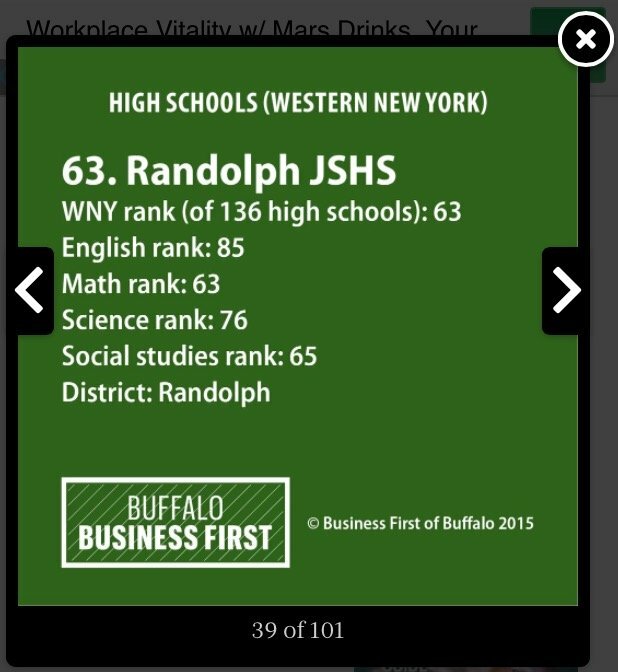 Randolph High School, also led by Principal Laurie Sanders and Assistant Principal Jason Halpainy, realizes improvement, ranking at #63 of 136 WNY high schools. That’s up from the 2014 rank of #66, 2013 rank of #68, and 2012 rank of #82. As our high school teachers begin to see classes entering much better prepared than ever before, we expect to see our Regents results climb as well. And last of course all of these gains positively affect our overall Randolph district rank, with district leaders: Director of Pupil Services Mary Rockey and Curriculum Coordinator Jamie Berg, which comes in at #44 of 96 districts in WNY–realizing a goal set by the BOE to be in the top half of all districts in WNY! Our district rank has climbed from the 2014 rank of #50, 2013 rank of #59, and 2012 rank of #74. Many, many thanks to everyone in our school community who has worked hard to take our students beyond our old expectations for learning–for every teacher who worked hard to learn the “new” math or dissect a new novel, to the parents at home struggling to help with homework or looking up lessons on the engageny website, to the students who have met every new challenge with aplomb and the administrators working every day to both challenge and support their schools–WELL DONE RANDOLPH! What an incredible time to be learning here! As a school district leader who writes and speaks about our school improvement efforts, I’ve been labeled a “Common Core” advocate. I’m not sure what that means to the people who use the phrase. Common Core may be the most misused and misunderstood term of our generation. If an advocate is one who speaks and writes in support or defense of a cause, then my cause is school improvement and I am an advocate of standards and systems that work. First, it’s our responsibility to lead so that we have schools with systems in place to ensure that ALL students are taught to the same high standards. That system can’t be one in which each teacher reads and interprets standards alone, plans a curriculum and lessons independently of every other teacher, and then modifies and adapts the curriculum based solely on her own hunches or feelings. A school district that’s healthy, coherent and cohesive puts systems into place to ensure that all teachers and administrators work together to read and analyze standards, design curriculum across and between grade levels and modify and adapt curriculum based on data that is both anecdotal and performance and test assessed. The systems must include a cycle of analysis for continuous improvement. Our school district has seen dramatic gains in student learning and achievement for all students by working together in these ways. Second, it is our responsibility to ensure that we have a school system in which every child receives the support he needs to learn. That support, individualized and differentiated, is meant for students at all levels from our most disadvantaged students to our most advanced. We must create schools with systems in place in which all students are supported through adaptive testing and diagnostic instruction. After 26 years in public education, the past 15 as an administrator, I’m tired of talking about differentiation as if it’s an easy expectation for teachers to meet. We will never be able to truly challenge all students if do not embrace computer based solutions in a blended learning environment in which we use artificial intelligence (AI) learning solutions to supplement more traditional (and important) learning opportunities. Third, school leadership must be first and foremost about instructional leadership. It’s the core of why we exist in the first place and we’ve left it last on our list of priorities for far too long as we’ve managed our buildings and districts. Fourth, we need to support and believe in our children. They deserve our very best and our best hasn’t been good enough for all children. We must expect more of ourselves and show children that we expect the best of them. We must raise our expectations for all children. 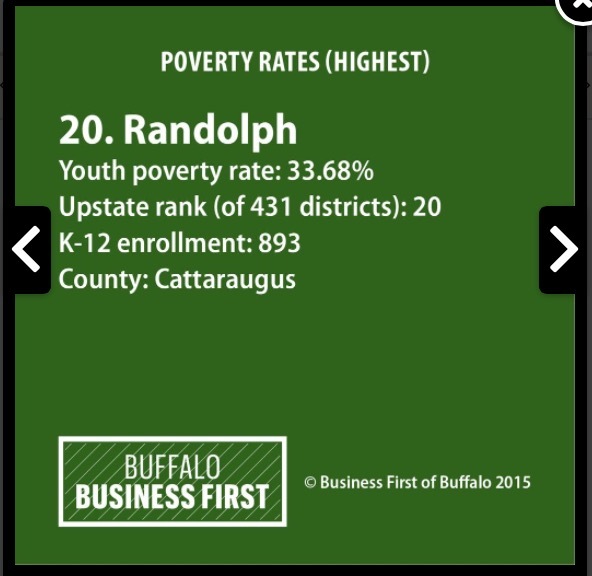 Of 431 districts in upstate New York, Randolph is ranked 20th on measures of poverty, and yet we have shown consistently for four years now that our children are capable of achieving so much more than ever before in our history as a district. Other districts have proven this before us. My most fervent belief is that we must show our children that we believe in them, in their intellect and ability, their strength and potential, especially when they don’t believe in themselves. We must show them that they can be more than their current circumstances. I know there are school districts where children have done well for generations. That’s not true for all school districts and all children. Children are not inherently bad or good, smart or stupid. They often are advantaged or disadvantaged. Public education can be the game changer for every child. It was for me. I am an advocate for every child’s ability to learn and grow and become more than perhaps any one expects. I am that child, grown and educated, to have become more than anyone would have expected. I’m here to make it happen for every child in our system. Am I a Common Core advocate? I suppose I am. Aligning our curriculum to rigorous, shared learning standards, working together and raising our expectations for every member of our school community have resulted in significant learning gains for our children. That’s a goal for which it’s worth advocating. Yesterday I met with an organization called HANY (High Achievement New York) and the Buffalo News Editorial Board. They wrote about our meeting in today’s Buffalo News. Do you want to know why the common core learning standards have been a good thing? Because in aligning our teaching and learning to the more rigorous standards, our students are learning more, deeper, earlier and better. That’s it. For every student who graduates I want to know that we’ve filled him or her up with as much knowledge and skill as possible and then that we’ve “tamped” it down and filled him up again. I want what we do with our students in our instructional programs to really matter, to lead them to success in later life. It’s the reason why I’m a school superintendent–to bring focus to our instructional program and increase our expectations for everyone, first of all ourselves. My number one responsibility is to provide the highest quality education possible to all of our children. I’m tired of the lunatics who continue to bash and personally berate anyone who dares to speak up and say, “hey, this is actually working for us.” You know why you don’t hear more success stories? Because 99% of educators are good decent people who are in this work to do their very best for the children they serve and they have no desire to put themselves out there to be attacked, maligned and belittled. And for every lunatic who tears apart our story or attempts to tear down who we are in Randolph or me personally—go ahead, because you don’t know us, haven’t been here and cannot speak to our story. You don’t know the challenges of our children nor do you have the authority to question their accomplishments, race or background. I will not be bullied into keeping quiet about our work and our school success. I continue to write and talk about the positive side of all of the changes from APPR and the implementation of the common core standards because it’s true that we needed to do better. My 25 years of working in public education in WNY lead me to say: we haven’t expected enough of most of our students; for students without significant external challenges or learning difficulties, it just hasn’t been all that hard to get a diploma; our brightest kids haven’t had to work to their full capacity; teachers have worked largely in isolation leading to a gazillion different pathways through our schools; administrators haven’t attended enough to the main reason we exist–our curricular and instructional programs. We’ve had NYS learning standards for the entirety of my career (since 1990) and we’ve been testing students to check their attainment of the content in those standards almost as long, longer if you consider the Regents exams. I don’t care one whit what we call the “new” standards–I care about what alignment to clear, rigorous standards results in for our RCS students. What we’re doing now is working. Our teachers, students and parents have worked incredibly hard to ensure that a Randolph Central education means something. We have an aligned, coherent curriculum in our elementary and middle school that challenges all of our students, not just our most learning challenged students. We’re making better informed instructional decisions on teams about what we teach and we’re using computer based adaptive testing and diagnostic instruction to differentiate for all of our students. We have systems in place that are working and our students are benefiting. As for the NYS testing? 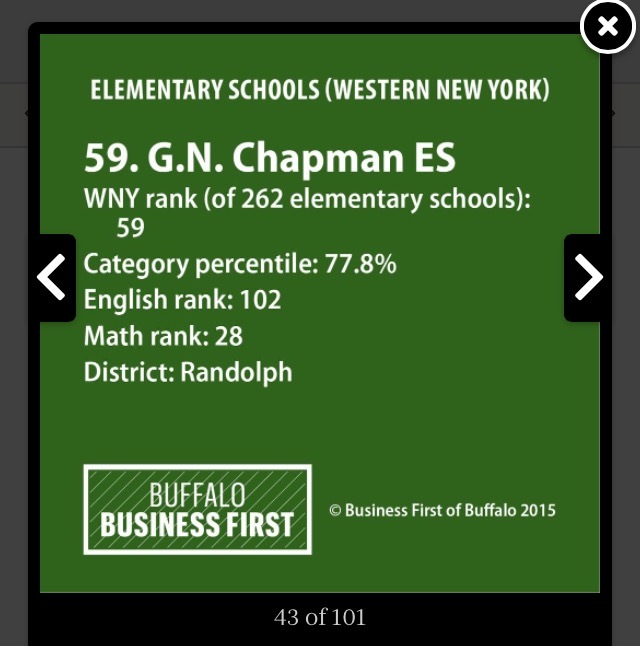 As Buffalo Business First rolls out the school rankings this week, here’s ONE measure of proof that our students are achieving more: Gail N. Chapman Elementary is ranked 59 out of 262 elementary schools. That’s up from last year’s 104 and from 174 in 2013. We’re here to keep children safe, to care for and love our children, to manage our responsibility to our school community and our taxpayers in a fiscally responsible manner. And we’re here to bring it, each and every day, with the best instructional program we can muster. Thank you to every family who entrusts your precious child into our care! While parents have the right to direct the education and upbringing of their children, it does NOT mean they have the right to dictate what the public school district teaches (our curriculum) or what programs and materials we use for instruction (ex. iReady). According to NYS Education law and Commissioner’s regulations, as a public school district we are required to follow the state mandated learning standards. New York State adopted the national P-12 Common Core standards, with some additions. These learning standards apply to all public elementary and secondary school students. The NYS learning standards also apply to students with disabilities and those students who are at a risk of not achieving the learning standards must be provided and must participate in academic intervention services. The New York State Education Department has provided resources for schools and parents on the website http://www.engageny.org/. Don’t believe everything you read on websites from across the country or on Facebook, please cross reference your information with the NYS education laws and regulations. Parents do not have a right to tell the school what their children will and will not be taught and as public school administrators and teachers we cannot follow parent directives. We are required to follow the directives of the NYS Department of Education. When parents advise their children to refuse all testing or to opt out of parts of the curriculum, it puts the child in a difficult position. Students are actually insubordinate if they refuse to participate in all testing or in our use of the instructional program iReady/Ready which we use in our Math and ELA programs, just as is the case with students who refuse to participate in physical education class or any other part of our academic programs. Please know that we very much want to work with you in the education of your children. As a public school district, we have more rules and regulations that we are required to follow than you can imagine—but we do want to hear from you, to talk with you about your concerns, to be flexible in the areas in which we can be. If you have any questions about the many changes that we’ve had in the past few years in education, or about anything, please contact your building administrator or me at any time. In the media, on blogs and twitter, I continue to read that one of the main arguments against the NYS 3-8 assessments is that they are totally secret– that there’s no information available to our teachers about how their students did so how does it inform their instruction– that we can’t see the test questions. These statements are simply not true. We had our results on August 14, 2014. We shared them with our teachers last summer. They used the results, along with what they knew from our iReady adaptive testing and diagnostic instruction, to plan for the 14-15 school year. Let me say it again. We do know how our students did on the test questions as they are tied to the standards. We have information about how our RCS students did on the test, how they did as compared to other students across the state by question, and we know what standard each question was tied to so we don’t need to see and analyze the actual test questions. Isn’t it better to focus on the learning standards than to try to teach to the test? Further, when teachers identify that a majority of students miss questions, they can often find them here. I would go so far as to suggest that NYSED posted the questions which were most frequently missed as I was talking with a curriculum coordinator in another district who found every single question that the majority of her students grades 3-8 missed. Then she sat with her teachers and they unit planned for the year to ensure that each grade level made the right curricular decisions. So why do so many people think we have no access to information about the results? Do other districts not know how to access the data through the (WNY)RIC? Is there not an administrator in every district to access this information and share it with teachers? We’re small and we have a curriculum coordinator, Jamie Berg, who works with our CIO, Mike Frame, and our admin team to get this information out of the NYSED portal. . .we were able to analyze this at an admin retreat on August 14, 2014. Why, then, do so many people continue to say that we don’t have access to information about how our students performed on the NYS math and ELA assessments? When I was a little girl growing up in Pittsburgh in the sixties and seventies, my mother worked as a secretary at Jendoco Construction. My memories of her as a working mom during those years are dear to me still and I believe influenced me in myriad ways as a working professional woman today. 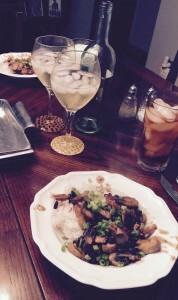 I hold Administrative Professionals Day–(really? )–Secretaries Day dear because I have the utmost respect for the work that my mother did for most of her life. For the last ten years of my mum’s life, she didn’t have it easy. We lost her a year ago at only 70 years old and in the end, she was constantly writing in notebooks–everything from recording her medications to her thoughts to her prayers. I believe that brought her comfort as it was much like she spent her life, taking notes, writing letters and memos, taking shorthand back in the day and preparing bids. I know she was a valued employee and that her work mattered because the people she worked with were like family to her. The company picnics, the dear friends she made and loved, the Christmas parties and the colleagues who emailed, called and visited her during her illness–they were as much a part of my mother’s daily life as we were. Maybe it’s in watching her that I developed my deeply held belief that no position is better than or more important than any other in an organization. We all play different roles and when we work hard, with integrity and good intentions, we all contribute to the health and success of the organization, just in different ways. When it comes to the day to day life of our school, many others are more important than I am–to the child who’s sick and needs the school nurse, or the parents who need information from a secretary, or a young student whose bus driver notices that no one is at home and so doesn’t drop the kid off at an empty house, or the teacher who needs a cleaner or custodian because a student has gotten sick in the classroom—those members of our school community are much more important on that day than I am. As teachers and administrators, we are central to the mission of a school, but it’s the support staff who do all that is needed to allow us to teach. I’m incredibly grateful to every hard working, caring, dedicated employee at RCS. I’m thankful that my mother taught me that no one is better than anyone else, that no one is perfect, and that hard work and dedication are worth it. Happy Secretaries Day to every wonderful, dedicated secretary doing the work each and every day! Of course in my mind, as good as you each are you’ll never measure up to my mom–but then, neither will I. At last night’s BOE meeting, BOE members voted unanimously to return to the two week spring break in the approved calendar for the 2015-16 school year. There’s a long history in Western New York surrounding a split break with a week off in February and another week around Easter or two weeks around Easter. Districts have varied on their approach with a real effort on the part of the local BOCES leaders, for obvious reasons, to have all component school districts on the same calendar. For many years Randolph maintained the two week break as we understood from our families that this was their strong preference. In the 2012-13 school year, we switched to the split break so that our students who attend BOCES programs would be on the same calendar with the rest of the schools in the Cattaraugus/Allegany BOCES. After three years of aligning with the rest of the schools, we are returning to the two week break from March 14, 2016-March 25, 2016. Why? For me, the most compelling reasons have always been instructional. What’s best for kids when considering their learning and achievement? Is a split break better because students only miss one week at a time and therefore retain learning? Or does a split break mean there’s even more lost instruction because of the loss of quality engagement the days before two breaks instead of one? When evaluating the change to a split break, I spoke with some of our teacher leaders and found that for instructional purposes, they strongly prefer the solid instructional block from the Winter Break around Christmas and the New Year to a two week Spring Break. They opined that breaking twice is less effective. Next we considered the argument that we have many families who don’t go anywhere on the break anyway, because they can’t afford a trip or the time off from work. What we found, instead, is that our families largely drive if they do take a vacation and they can’t do so with only a one week trip. For the most part, our families can’t afford a trip over only one week because they can’t fly everyone somewhere. And many of our families continue to take two weeks during the Spring break, with the problem of missed school days for their children. Our daily attendance rate, which is usually around 95-98% was down to 79% before our break this March. While realizing the impact it will have on our approximately 40 BOCES students who will have a different calendar for 8 school days, we have planned to transport students during the first week of the spring break if they will attend. And in February, when BOCES is on break and we are in full session, the CTE students will have half days here at RCS. It’s important that we work well with our neighboring districts and our BOCES. It’s also important that we respond to the needs of our families in our community. The approved school calendar for 2015-16 will be posted on the District website. Would I Opt Out My Own Child? No. No. Don’t opt your kids out of NYS testing. Do we want to teach our children that they don’t have to sometimes do things that are hard? Or that if we don’t like something the school or our boss or our parents decide, we can just say, “no thanks, I’ll pass”? Yes the APPR changes for next year are a disaster and I disagree with the governor’s education reform on several key points, including making student test scores such a significant portion of our teachers’ evaluations. So let’s make noise about that, let’s advocate for a fair and accurate measure of evaluating teachers, which I do believe includes some measure of student performance. Let’s work together–teachers and school leaders to develop plans that work. We don’t even have the guidelines from NYSED yet. The APPR plans we have in place right now don’t use test results to a ridiculous proportion–our teachers have done well under our current plans. Why opt out next week if what you’re really upset about are the changes for 2015-16 that we don’t have details on yet?